Today, neuroscientists are imaging, mapping, testing and dissecting the source of the worst behavior imaginable in the brains of the people who lack a conscience: psychopaths. Neuroscientist Dean Haycock examines the behavior of real life psychopaths and discusses how their actions can be explained in scientific terms, from research that literally looks inside their brains to understanding how psychopaths, without empathy but very goal-oriented, think and act the way they do. Some don’t commit crimes at all, but rather make use of their skills in the boardroom. "...an informed, masterful account of the theory, research, controversies, and issues surrounding the construct of psychopathy . . . His balanced and scientifically sound coverage of the literature and issues are admirable and refreshing. Readers not familiar with the technology and procedures of neuroscience will appreciate the way in which Haycock makes the science understandable, interesting, and relevant. Highly recommended." -- Robert D. Hare, Ph.D., author of Without Conscience: The Disturbing World of the Psychopaths Among Us and developer of the the Psychopathy Checklist-Revised. "[Haycock's] writing is colored by a strong commitment to narrative, with almost every chapter opening with vivid stories of psychopathic violence or diagnosis, and he peppers his accessible discussion of brain structure with references to comic books, science fiction, Norman Mailer, the television shows Boston Legal and The Sopranos, and the Lord of the Flies. He is what Slavoj Žižik would sound like if he were a neuroscientist instead of a Laconian theorist. 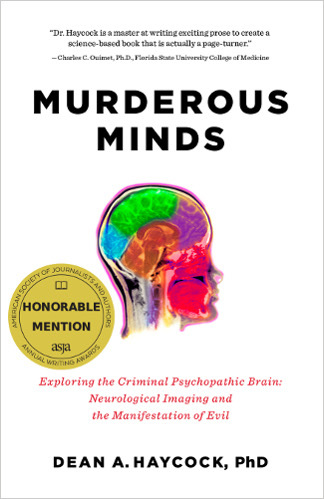 Overall, the book offers an excellent account of the current state of play in mapping psychopathic behavior with neuroscience, giving evenhanded time to both the older school of assessment which relies on interviews and a numerical scale of traits (lack of remorse, mendacity, sexual promiscuity, and so on), and the new cowboys of the fMRI. 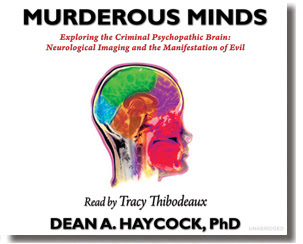 It should be required reading for anyone who wants to know more about the brains of violent criminals." -- Mark Kingwell, Professor of Philosophy at the University of Toronto and author of Measure Yourself Against the Earth. Presented by Cherry Hill Publishing. Thibodeaux was hit by the broadcasting bug a year before he completed his undergraduate degree in Education. He went on to enjoy a twenty-year career in radio, accomplishing on-air success as a DJ and host in several morning and afternoon drive time slots and behind the scenes as a Program Director, Music Director and News Director. Tracy has voiced many commercial, instructional, educational, narrative, and public address projects. When he isn't in his studio voicing a gig, he hosts a podcast, Pods o' Pop, which features some of the world's greatest and most accomplished singers and singer-songwriters and their music. Find Tracy behind the mic of other outstanding Cherry Hill Publishing audiobook productions including Nameless and When White Fades to Black, by Joe Conlan, Frame 232, by Wil Mara, and Miracle Man, by William R. Leibowitz.